Boomer Women Travel - LET'S SUPPORT OUR VERY OWN DEE DEE HIXSON AT HER FIRST BOOK SIGNING! LET'S SUPPORT OUR VERY OWN DEE DEE HIXSON AT HER FIRST BOOK SIGNING! Dee Dee has just published her first book. 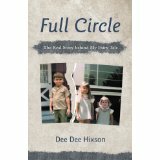 It's called "Full Circle - The Real Story Behind My Fairy Tale". It's the story of her amazing life and how she survived the most devastating challenges and losses. I am not a reader but I couldn't put this book down. I read it and finished it the same day she gave it to me! It's that good and it keeps you hooked through every chapter. It is a must read! If you can't make it to the book signing go to amazon.com and order it. Please join me for my first book signing. Light refreshments will be served. Feel free to invite guests but please RSVP for the total number. Space is somewhat limited. If you have already purchased a copy of the book and would like it signed, please bring it with you. Otherwise you can purchase at the event if you wish.